Need to use up some oddballs and small bits? Try Dez’s Wacky Hat. It’s simple. Just a garter stitch earband, with the main body of the hat done in ridges of knit/purl welt. Each band is done in an alternating colour, giving a “peekaboo” effect. I did mine using up a small ball of rainbow variegated and a small ball of royal blue, but of course you can use any two (or more) colours you wish. Contrasting colours give a neat effect, using the darker colours for the purl welts and the lighter or brighter colours for the earband and knit-stitch bands. Worsted yarn and gauge of about 5 st./in This happens for me on size 8 needles. Change to colour B and knit one row. On the last knit round, change to colour B and K7, K2 tog all around. Change to dpns at the point you feel is appropriate during the decrease rounds. The point is to do the decreases on the knit rounds, where they won’t show. Change to colour A and K6, K2tog all around. Change to colour B and K5, K2 tog all around. Change to colour A and K4, K 2 tog all around. Change to colour B and K3, K2tog all around. Change to colour A and K2, K2 tog all around. Change to colour B and K1, K2 together all around. Purl two rounds. K 2 together all around. Draw remaining stitches together and bind off. You may add a pom-pom, tassel or other embellishment if you wish. Weave in all lose ends and wear immediately. This is a fun, fun hat. It also looks nice in a solid colour for the whole thing. Actually I did one in a solid colour for the prototype. 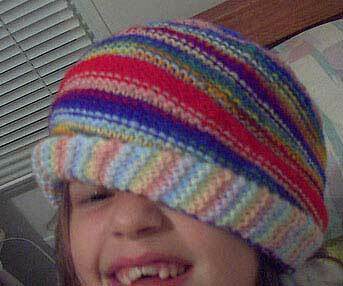 I just found this link when I ran out of copies of my own Wacky Hat Pattern and Googled the title, hoping to find a copy I had online, so a friend could knit the hat. How nice that my pattern is still on your site, many years later — thank you! And the accompanying photo is adorable. For the record, I still hold copyright for this hat (permission to re-post this free pattern, but not to profit from it, is granted provided the copyright notice is made, as you properly did), and my new email address is dezcrawford@gmail.com.